Happy New Year's Eve! Please click on the first picture and read the sentiment. I love this stamp by Endless Creations. We should all take a moment to reflect on the past year and look forward to the New Year. and the sentiment inside is All Night Media. 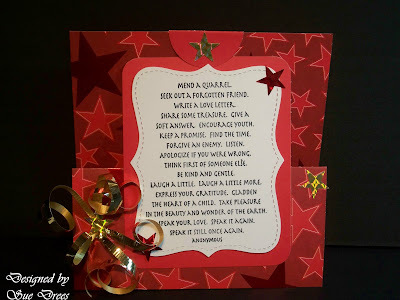 I'm entering this card in the House Mouse Challenge, winter wishes. Just staying in tonight. Rick worked late tonight again and he is so tired, so we are just camping out here with the tree lights on and the furnace running and eating and drinking some of our Christmas goodies. I'd like to thank everyone who has made blogging this past year so much fun. To everyone who has visited, for everyone who has taken the time to leave a comment and for Kellie for asking me to be on the design team for Magnolia Down Under. All of this has been so rewarding and I have met so many people and communicated with so many. And, the best reward is, I always have a stash of ready made cards now!!! I hope everyone is with someone they love, doing something they enjoy and wish you a very Happy, healthy, safe New Year. Tomorrow at noon, I will post the January 2010 Giveaway! Perfect card for New Years! Good point... Wise sentiments make me feel sorta, sorta.... well, the stamp has it better put-together than about 80% of humans, lol. I hope you and Rick had a cozy time this new year!! Those mice are darling, love the colouring as always!! You are a house mouse master!! Ohhh Sue,what a beautiful card,i love your image and papers. This is so beautiful -- you have chosen such perfect colors! Your New Years sounds like just the right kind to have. Ours was very quiet with a tired DH taking a late nap and awaking just before the dawning of the new year! I have had such a wonderful journey with you this past year and I look forward to 2010! Happy New Year and Happy Stamping! This card is gorgeous and that sentiment is so poignant - love it. 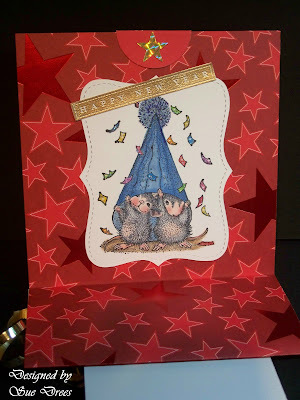 Hi Sue this image def has the Awww factor love it..great colour combo fab card thanks for joining us at HM&F challenge..